Introduction: In the modern era of Minimally Invasive surgery, Single Incision Laparoscopic Surgery (SILS) aims to widen the horizons of conventional laparoscopic surgery. Although Natural Orifice Transluminal Endoscopic Surgery (NOTES) is potentially seen as the pinnacle of surgical innovation, its complex technique with a longer learning curve, possible complications due to the visceral breach as well as limited social acceptance, threatens to limit its application. On the contrary, SILS is rapidly gaining popularity in the clinical setup for performing a number of different procedures. It is performed via a single transumbilical incision which results in a non-visible postoperative scar giving an excellent cosmetic outcome and making the procedure virtually scarless. In this study we present our initial experience of SILS, using standard ports and technique, and try to assess its prospects in a developing country. We also aim to identify the potential problems it may encounter in becoming a routinely performed procedure. 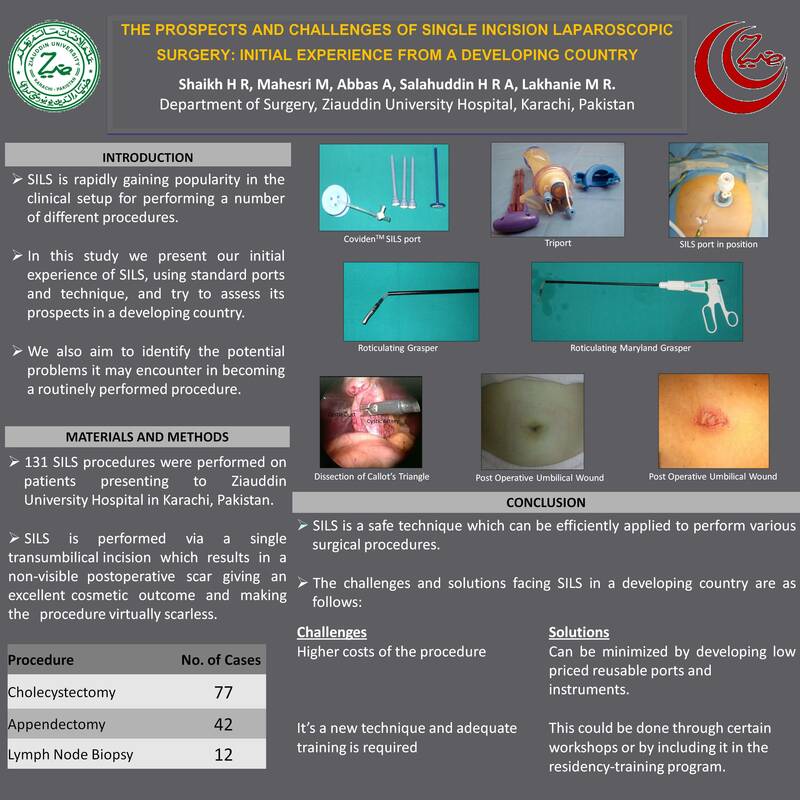 Materials and methods: During the one year study period, 131 SILS procedures were performed on patients presenting to Ziauddin University Hospital in Karachi, Pakistan. The procedures performed included cholecystectomy (77), appendectomy (42) and tissue biopsies (12). A single multi-channel port was used to perform SILS via a single transumbilical route. Two different kinds of multi-channel ports were used. The data was collected prospectively, using a pre-designed questionnaire. Results: Patient demographics such as age, gender and BMI were recorded along with other operative and post-operative variables. Two cases of SILS required insertion of additional ports while none were converted to open surgery. The mean operative time for SILS was 51 mins (22-131 mins) for cholecystectomy (SILC), 48 mins (30-125 mins) for appendectomy (SILA) and 17 mins (12-30 mins) for tissue biopsy (SILTB). Mean operative blood loss, postoperative pain, analgesia requirement and mobilization were comparable in all patients of SILS. Hospital stay ranging from 5 hrs for lymph node tissue biopsy and 34 hrs for cholecystectomy was recorded. No complications were reported in any patients and all were able to swiftly return to normal activity. At follow-up, all patients showed satisfaction with the excellent cosmetic result and reported that the scar was barely visible. Conclusion: Our experience suggests that SILS is a safe technique which can be efficiently applied to perform various surgical procedures. Its added benefits such as less pain, early discharge and return to work along with the excellent cosmetic result have the potential of making SILS a very successful procedure. However, It’s a new technique and adequate training is required. This could be done through certain workshops or by including it in the residency-training program. Once the learning curve is overcome and experience is achieved in this technique, the considerably longer operative times also improve. However, in developing countries, the biggest challenge facing SILS is the higher costs of the procedure.